Achievement: Shadow of a Sundered Star, and subsequently You Had it Coming as a result of not unlocking the former. Achievement completed on 9th Feb 2019. 3 player coop. Forerunner, halo 4. Legendary. Had a few skulls on as well. Got to just shy of 30k score in game. Multiplied up to around 58k post game. Achievement never popped. I checked way point and my coop time is well under 3 hours please help. My legendary speed run in career for co-op and on waypoint both state I am under 2 and a half hours total for Halo CE, we ran a few more missions even after we saw my time was well below 3 hours, a ran a solo legendary speedrun, and a couch co-op speed run. It still hasn't unlocked. Thank you DEVILDOGZ88 I didnt see that they were investigating. Is it because of the January update? If you're posting about the sub three hour achievements not unlocking, that's something we're aware of and investigating. Please do not post about them anymore. When we have information on them, we'll let you know. 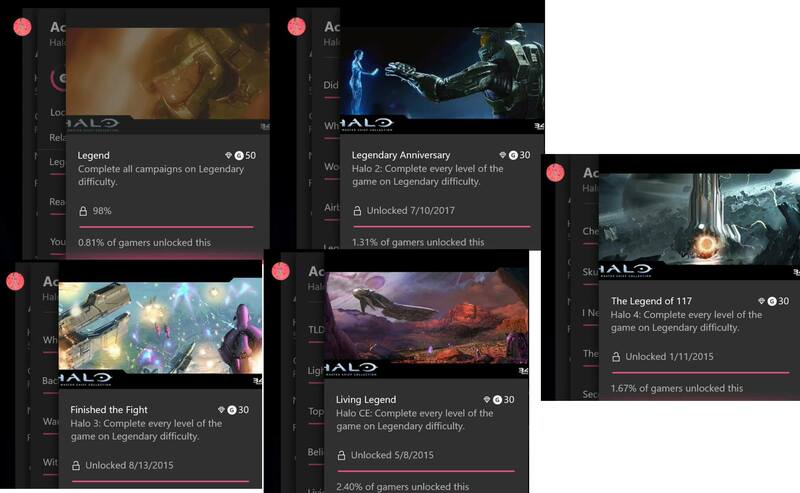 [If achievement did not unlock] Was playing Halo 3 Legendary Coop with a mate last night. Completed 4 missions from the start of Halo 3, picked up all the skulls in those missions. My mate got all the achievements, I got nothing. Also am sitting at 98% of the medals achievement and never progressing. Basically Halo 3 now gives me no achievements of any kind, no matter what I do. Local save showed all the relevant missions completed, but Halo Waypoint said I haven't done them. I then deleted my local save which just re-downloaded the same save with the same data. Re-collected a skull and the achievement still didn't pop. Then I deleted local and cloud saves, which forced a re-download from Halo waypoint. Now it shows I haven't completed those missions (consistent with Waypoint) but when I then re-collected a skull the achievement still didn't pop. Don't know what else to do? I finished Midnight in 21:31 and didn't get the par time achievement. On top of that, it didn't update my legendary time on Waypoint. Related to this, I did Forerunner in 16:09 on legendary and it also didn't update my time on Waypoint. I already had the par time from a previous run though. I know the sub three hour achievements are glitched since the last update, but are all achievements related to times also glitched? If so this is definitely something that we should informed of. I got goat roped and you’re joking achiements to unlock. But I did my last mission on halo 3 for the devasting ach any suggesting to make this one pop? Unfortunately the answer is to replay it. Hopefully it's not the last mission that didn't register and the achievement will pop before you get there! 4. Achievement did not reset, just was never unlocked. Did Arbiters Journey playlist with a friend and it shows completed 7/7 missions. Three playlists are now complete but the achievement never came and shows at 66% complete still. Yea when we started the playlist it skipped the The Heretic for some reason and put us right into The Arbiter. After we completed it showed 6/7 so we restarted and watched the cutscene and then showed 7/7.